We are wrapping up the 2019 winter with a significant snowpack in the Truckee River watershed. Runoff really hasn’t started yet and the Truckee River at the Reno gage has been near or above 2,000 cfs for weeks. 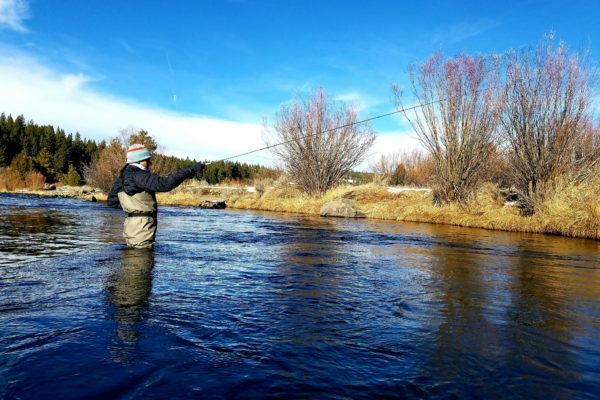 To help folks to wrap their heads around how best to fly fish the Truckee during high water I have prepared a short list of tips for success during high water. I believe high water conditions on the Truckee River are when the flow is in excess of 1,500 cfs. That being said, all anglers should approach the river with the understanding of staying within their own limits and adjust individual approach based upon conditions day to day and location to location. In high water events, fish will typically stack within one to ten feet of the bank. The swift current bombing down the river channel pushes the trout out of their usual holding lies and up tight to the bank. When walking along the flooded bank, try to avoid going deeper than the top of your boots. This allows you to sneak up on fish that are already in a shallow position. If the pocket or seam requires the angler to get into the water, an upstream presentation is almost always the best way to stay hidden and present flies effectively. 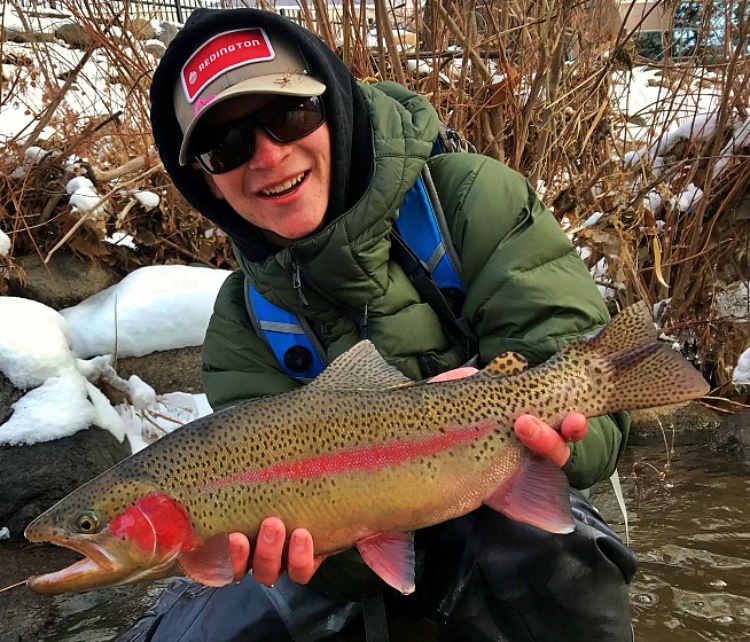 This presents the angler with the opportunity to hook some of the biggest rainbow and brown trout the Truckee has to offer. High water isn’t for the purists. 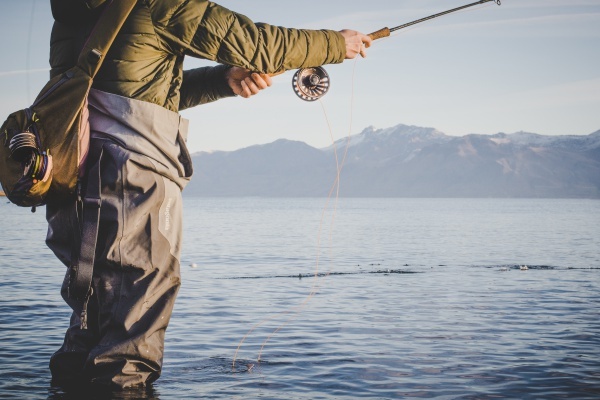 Getting dirty requires the angler to deploy methods others frown upon… Its all about giving yourself the best odds of finding fish when the water looks anything but promising. This may include fishing pegged eggs, worms, mop flies, or soft plastics on a fly rod. If it’s legal, have at it. I prefer bright colored eggs and worms in orange, pink, and chartreuse (yes, chartreuse eggs n’ bacon) in water with less than two feet visibility. Stoneflies with lots of legs are a great fly to hang behind one of these attractors. When targeting trout in high water, they often congregate in small pockets or seams. The inside edge of a river bend, a back eddy, or downstream side of structure such as woodpiles and boulders all provide habitat through high spring flows. These features break up the current along the bank and allow fish to expend a minimal amount of energy while feeding. 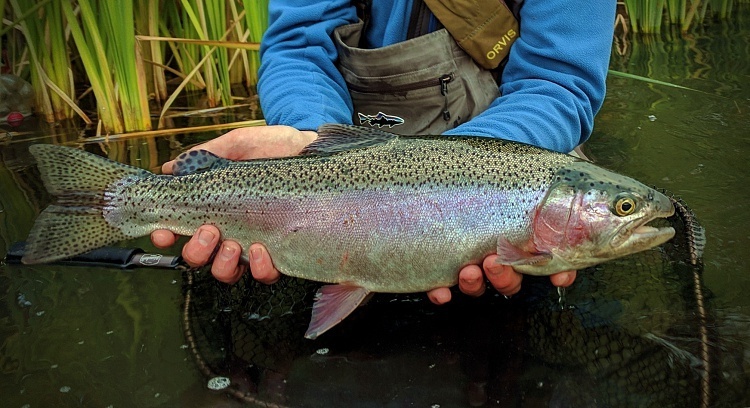 Like all other seasons, trout will focus on edges that allow them to swim in slow water but provide them with a steady stream of meals (the bug buffet). 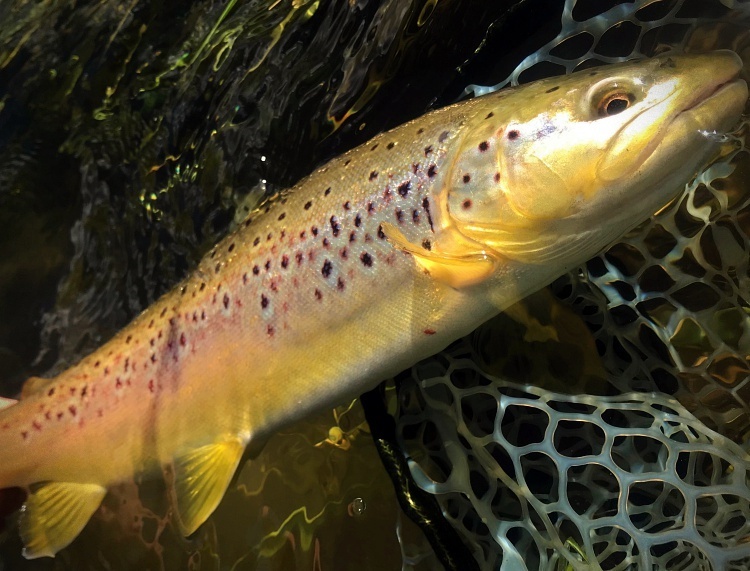 As temperatures rise through the Spring fish will be more likely to move further for a fly. This allows the angler to make fewer drifts and get more grabs. High water is all about maximizing efficiency and keeping your fly in the water. Most often, anglers assume that in order to be successful in high water, their rig must sink to the bottom as quick as possible. With most fish pushed up tight to the bank, I’ve found that heavily weighted flies snag debris much more often and rarely prove more effective. (Slots six feet and deeper would be a great place to deploy heavy rigs and long leaders). Instead of tying a squirmy worm or stonefly nymph on a 1/8 ounce jig, try one large tungsten bead or a big split shot instead. Split shot tends to be most effective since the flies hover just above the river bottom, reducing the likelihood of snags while presenting the flies in the strike zone. I prefer one large split shot (AB or AAA) with two to three unweighted bugs. Oftentimes, a fly that is heavily weighted loses the ability to move and flutter in the current. 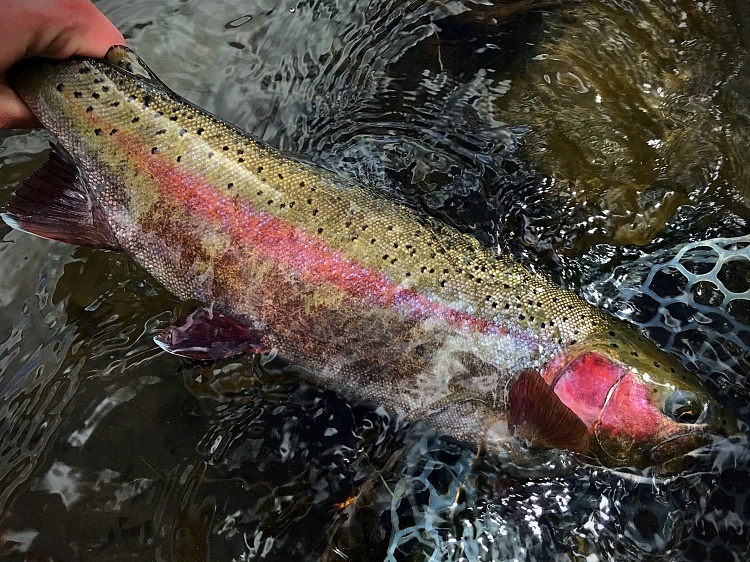 When trout are in fast water, it is not as big of an issue. Give yourself every possible advantage. And finally, have fun! Don’t take it too seriously. High water can be really tricky and frustrating at times. When the water clears for a few days, the fish push into deeper faster slots so they aren’t exposed. Allowing yourself to be adaptable will greatly increase your chances of hooking a Truckee River trout. 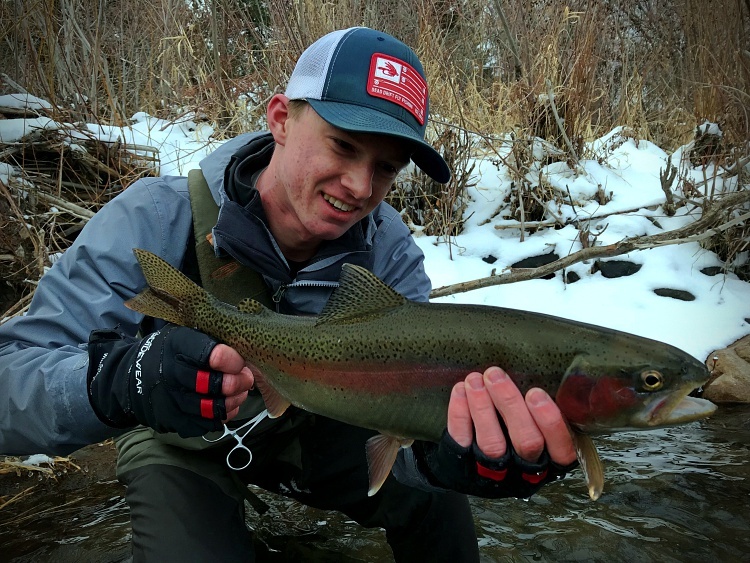 Aden Breckner is a staff member at the Reno Fly Shop. Having grown up here in the Truckee Meadows he has spent more time becoming familiar with our local trout than many people twice his age. He is creative and innovative in his pursuit of trout and steelhead all over the western United States. If you haven’t met Aden yet reach out on social media @beadsnworms_ or swing by the shop. 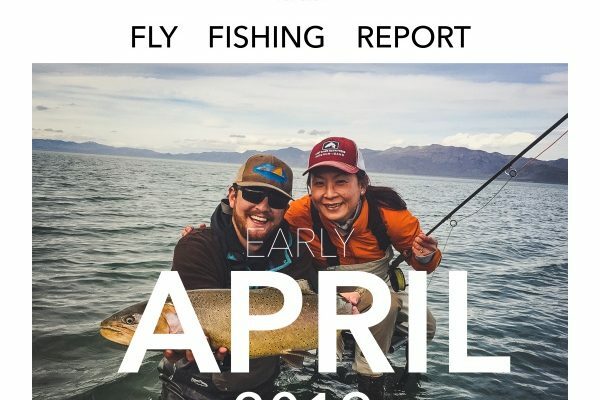 Aden is always more than willing to share his recent trip report and a new fly he is working on.